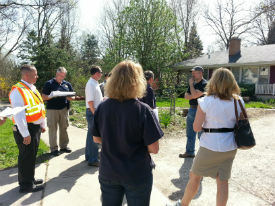 UPDATE 5/1/2013: A team of officials from the Federal Emergency Management Agency(FEMA), Illinois Emergency Management Agency(IEMA), U.S. Small Business Association, DuPage County Office of Homeland Security and Emergency Management, and the Village were out in the community this week assessing flood damage from the storms of April 17-18, 2013. This is the next step in the process to obtain a federal disaster declaration. Please note that FEMA assistance is not yet available; it will only be made available if DuPage County is included in a Presidential Disaster Declaration. With more than 40 Illinois counties affected by the flood, it is likely to take several weeks before FEMA is able to complete their assessment and a determination regarding providing federal disaster assistance can be made. Residents are encouraged to monitor the Protect DuPage website and Protect DuPage Facebook page for updates regarding flood recovery, including updates pertaining to the federal disaster declaration process. The Village will also provide updates on the process via our website, Facebook, Twitter, E-News and DGTV, as they become available. Responses to the Flood Damage Assessment Survey can be seen on the MAP. Each dot represents a survey response. If you experienced flood damage and would like to complete a survey, you may still do so. This information continues to be helpful in compiling a thorough assessment of flood damage. The survey is not an application for individuals to receive funds, but is a first step in determining whether state and federal disaster funding will be made available. If and when funding is available, completed surveys will not be a requirement to receive funding. You will still be able to apply for potential funding, even if you did not complete a survey. The STAFF REPORT regarding Village storm response provides an overview of the April 17-18, 2013, storm event, summarizes its impact on the Village and outlines the Village's response to the storm.